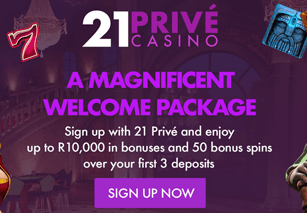 Play at 21Prive Casino , the new multi-developer-supported online casino offering South African players the chance to play in rand (ZAR) and win big with exclusive bonuses, promotions, progressive jackpots and more. Now, you can access this global casino to play the slots, deal the cards and play video poker, not to mention the specialty games. A customer-first casino, 21Prive promises players a high level of service, as well as the security and user-friendliness you would expect from any top SA online casino . Online Casinos South Africa visitors can also claim a welcome bonus of up to R10,000 Bonus + 50 Bonus Spins. This bonus can be claimed over you fisrt three deposites. Claim them by playing now on the instant play casino (using your desktop browser). You can even claim them on the mobile casino, which is ideal for anyone using an Apple or Android device. Gaming on the go just got easier. No matter where you are, you can pull out your Apple or Android smartphone or tablet and start playing your favourite games. All you need to do is open your mobile browser and enter the casino’s web address, or head over to the casino site on your desktop, click the ‘mobile’ tab, enter your phone number and you’ll receive an SMS with a link that will take you straight to 21Prive. If you have an Apple device, ensure you are using the 4.0 iOS or a later version (applicable to iPhone 3GS, 4, 4S and 5 or iPad 2 and 3). For Android users, all you need is a device that operates Android 2.3.5 or a later version). Using software from developers such as BetSoft, Microgaming, NYX, Leander and the better-known NetEnt, you can access a wide variety of games, all of which are exceptionally designed, well thought out and function well too. From the slots to the tables, you’ll have no problems placing your bets for a chance to win one of the many jackpots on offer. If you love to watch the reels spin, head over to the casino’s slots section where you’ll find an extensive array of video and classic slots. Ensure you keep an eye out for the progressive slots and for the cash attack games, which could net you a neat mystery bonus delivered straight to your real money account. Want to hit the tables? Why not try to hit the lucky 21 on the blackjack table or watch the wheel spin as you place your bets on the roulette board. If specialty games are more your style, you’ll be glad to know that this SA online casino offers them in spades (pardon the pun). Why not see if it’s your lucky day with the scratch cards or place a bet on the 3D virtual horse races? If your number comes up, you could walk away a lot richer than when you started. - On a Monday, claim the 25% bonus when you make a deposit and ensure your week gets off to a great start. - On Tuesdays, cross your fingers and your toes because the mystery bonus could reveal a big sum of cash in your real money account. - Start Wednesdays with a small bonus and watch that bonus grow for every deposit you make during the day. - Don’t forget about Thursdays when you can claim your 2 x loyalty points. - Playing on the weekend? Then take note: there’s a dish of the day bonus that will boost your balance, as well as a weekend cash match, but you’ll have to head over to the casino to find out just how much you can claim. A quick live chat session or email and every problem is solved when you contact 21Prive. Setting the standard for how every South African online casino should be treating its players, 21Prive prides itself on its fantastic customer service and the support staff will go to great lengths to ensure that you’re happy every time you play. Make your deposit now using your credit or debit card safely and securely or use a wide variety of ewallet systems to add that extra layer of encryption to your deposits. 21Prive Casino also accepts EFTs and wire transfers so that you can add cash to your real money account in the way that works for you. 21Prive’s gaming variety is absolutely astronomical and should you take the time to browse through the site, you’ll find no shortage of games made to suit every type of player. Take the time to try them and you’re sure to find one (or more) that you’ll fall in love with. Pleasing South Africans is not always easy but 21Prive Casino certainly can. With its exceptional bonus offers and the bright and brilliant games, players will be thoroughly thrilled by their experience with this new SA online casino and it’s more than likely that 21Prive will build a loyal following in the country in no time.